Who Should Attend the Agency Meetings In Your Review? 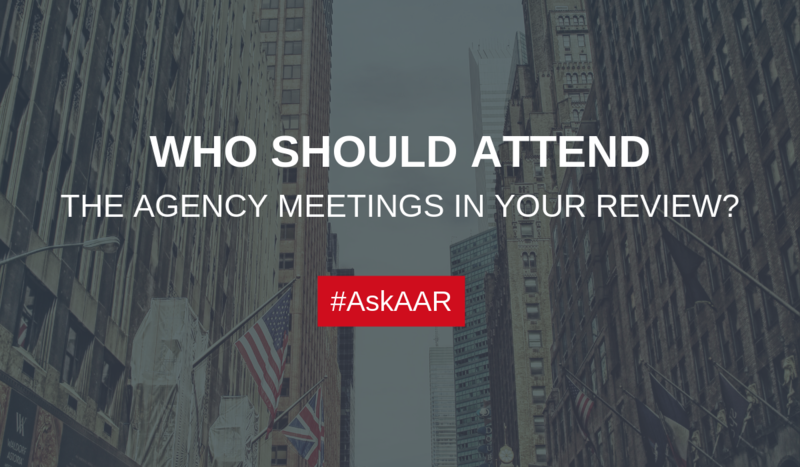 Who Should Attend the Agency Meetings In Your Review from AAR Partners on Vimeo. Hello and welcome back to another agency search quick tip from AAR Partners. AAR Partners is an agency search consultancy managing agency reviews for marketers since 1980. Another good question and the answer to this question is quite simple. Anyone who will be directly involved with managing the agency relationship on a day-to-day basis must be present at all meetings throughout the agency review process. Keep in mind that the review process should be a realistic preview of the agency relationship and the only way to get a solid sense of the agency’s resources, team talent, culture and more is to be present at the meetings. And that also includes the chief marketing officer. The CMO should not only attend the final pitch meetings without being part of previous meetings leading up to the final pitch. The final pitch is a culmination of the entire process, and it’s important to experience how the agency got to the suggested recommendations in that pitch. Communication and collaboration are two keys to a successful client-agency relationship, and the groundwork starts getting laid in the review process. With that said, it’s important to have the core marketing team, including the CMO, attend all meetings through the search process. There you have it. If you have a burning question about your agency search, AskAAR by posting your question on Twitter or LinkedIn but be sure to hashtag it with #AskAAR. Every other week I’m right here answering your questions. Good luck with your agency search and if you need any guidance, think of AAR Partners! We’ve been managing agency review since 1980, and we’d be delighted to help you too.